A view of the mall’s exterior. Seventy per cent of the construction of the Mall of Qatar in Doha, Qatar, slated to be one of the largest shopping malls in the world, is completed, said Mohamed Moataz Al-Khayyat, CEO of Qatar-based UrbaCon Trading & Contracting. 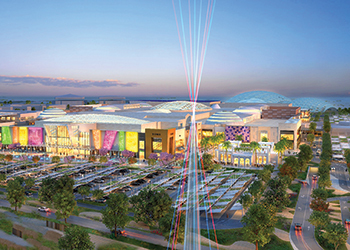 Estimated to open in the first quarter of next year, the Mall of Qatar will serve an estimated 20 million customers a year, with 400 shops that will include high-end luxury goods, the world’s powerhouse brands and an array of food, beverage and entertainment outlets. There will also be a luxury hotel, a family entertainment centre, a five-star restaurant and 82 other restaurants, cafes and other eating establishments. Being built at an estimated cost of up to $1 billion, the 4,176,000-sq-ft shopping centre will be adjacent to a Fifa 2022 World Cup stadium, and will have a dedicated station on Doha’s new metro line. The centre will have more than 1,750,000 sq ft of retail leasable space on three levels, along with underground and surface parking for 7,000 cars. UrbaCon Trading & Contracting has been involved in several huge projects over the last few years, which apart from the Mall of Qatar, include the Banana Island Resort, the Sheraton Doha Hotel and Convention Center, and the Lekhwiya Stadium at Al Duhail.